Terry Branstad's selection as US ambassador to China signals that US President-elect Donald Trump attaches great importance to the US-China relationship, Russian academic Alexander Larin told Sputnik. For his turn, Chinese expert Liu Jianyong remarked that Trump needs some help to understand China better. Iowa Governor Terry Branstad's selection as US ambassador to China shows that President-elect Donald Trump is taking US-Chinese relations very seriously, Alexander Larin of the Russian Academy of Sciences' (RAS) Institute of the Far East told Sputnik. "This information about the potential appointment shows that Trump attaches great importance to US-Chinese relations. He cannot ignore the criticism… in regard to the riskiness of measures he is going to take against China. He is taking steps to prevent further escalation of tensions with China. The appointment of an ambassador is not a short-term measure. The ambassador is meant to work long enough. He is due to play a role in maintaining relations between the US and China," the Russian academic emphasized. "And it appears that it will be no walk in the park for him [Branstad] because he will have to resolve various disputes and problems in [US-Chinese] bilateral relations. 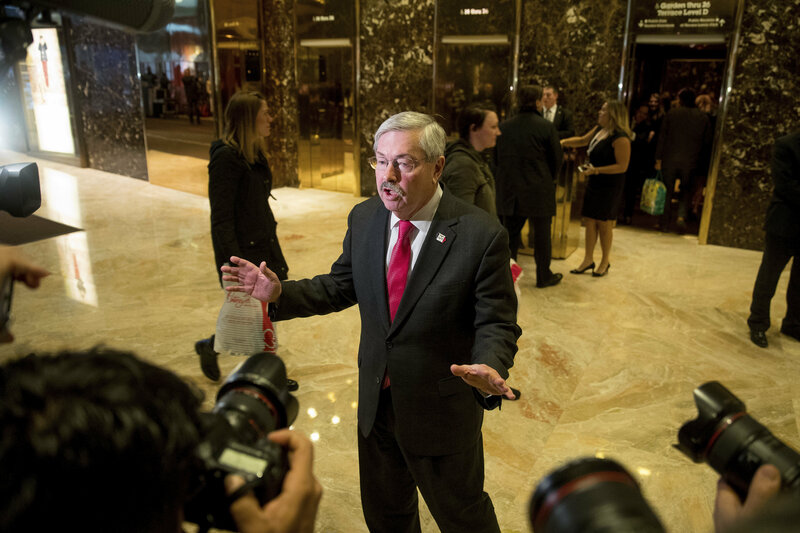 Apparently therefore Trump counts on [Branstad's] longstanding relationship with China, as well as his flexibility and positive and constructive experience of collaboration with the country," Larin explained. Indeed, Branstad has known the current President of China, Xi Jinping, since the 1980s. Back in 1985 Xi, then a 31-year old Hebei Province party official and director of the Feed Association of Shijiazhuang Prefecture, visited Iowa as part of the Chinese delegation to study American agricultural practices. There Xi been acquainted with Terry Branstad, then the first-term Republican governor of Iowa. The two officials met again in September 2011 during Branstad's trade mission to China. The Iowa Governor invited Xi, who had assumed the position of China's Vice President, to revisit the state. "The strong relationship Iowa has with the incoming leader of China has economic benefits that are beyond measure. This is a tremendous opportunity for Iowa, and we will make the most of our time with Vice President Xi," Gov. Branstad noted ahead of Xi's trip to the United States in February 2012. Over the years the Iowa Governor has maintained close economic relations with China. According to the US-China Business Council China became Iowa's second export destination after Canada. Iowa exported $1.4 billion worth of crops to China in 2015, while the overall China exports profit reached $2.3 billion. China's Foreign Ministry hailed Trump's decision to pick Branstad as the US Ambassador to China. "Mr. Branstad is an old friend of the Chinese people, and we welcome his greater contribution to the development of China-US relations. The US ambassador to China serves as an important bridge linking the governments of the US and China. We are willing to work with whomever that takes this position to strive for the continued, sound and steady development of bilateral ties," the ministry's spokesperson Lu Kang told a press conference Thursday. It seems that Trump wants to reduce the negative effect of his tough rhetoric toward Beijing and election promises to impose high tariffs of Chinese goods, which some Chinese observers amounted to a declaration of a trade war. Speaking to Sputnik, Liu Jianyong, the expert in foreign affairs at Tsinghua University, echoed Larin. "As the US President-elect who has not yet officially taken office Donald Trump has made a series of inacceptable statements [about China]. That has hurt the Chinese people's feeling and created an extremely negative background for Sino-American relations," Liu highlighted. Will Trump 'Try to Drive a Wedge Between China and Russia'? "It would be especially beneficial for Sino-American relations if Trump's future team will include assistants and consultants able to help him understand China, realize basic principles of the US-Chinese relationship," the Chinese academic told Sputnik. Liu was apparently referring to Trump's phone conversation with Taiwan's President Tsai Ing-wen qualified by some Chinese observers as a violation of the "One China policy." The US President-elect's Friday conversation with the Taiwanese leader broke tradition adopted since 1979 when official diplomatic ties between Washington and Taipei were cut off. Thus unsurprisingly, Donald Trump came under heavy criticism from both Chinese and American observers following the talks. "China has the ability, even on that issue, to make us feel a little bit more uncomfortable for this phone call having taken place," Douglas Paal, former director of the American Institute of Taiwan, told the Wall Street Journal and referring to the fact that Trump's move puts North Korea sanctions at risk. "The world will be dragged into a mess if leaders all speak irresponsibly. This shouldn't be allowed. Trump as future US president should know what to say properly on different occasions," Wu Xinbo of the Center for American Studies at Fudan University wrote in his op-ed for The Global Times. In response to growing criticism Trump tweeted: "Interesting how the US sells Taiwan billions of dollars of military equipment but I should not accept a congratulatory call." To make matters worse the US President-elect has made a series of critical statements toward Beijing following the controversial call. Still, as Shi Yinhong of the Center for American Studies at Renmin University of China noted in his interview with The Global Times, "The Chinese government is still taking a watch-and-wait policy, and expects a smooth development of the China-US relationship in Trump's era." Time will tell whether Gov. Branstad will be able to smooth over tensions between China and the US and create an atmosphere of mutual trust and cooperation.